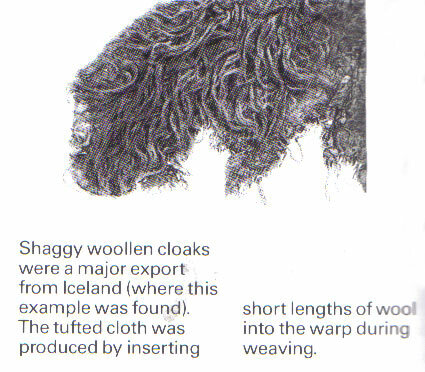 I used the search mechanism and was surprised to see no discussion on Irish Shaggy Mantles. I would like to reproduce one, but I have no idea really how they were actually made. 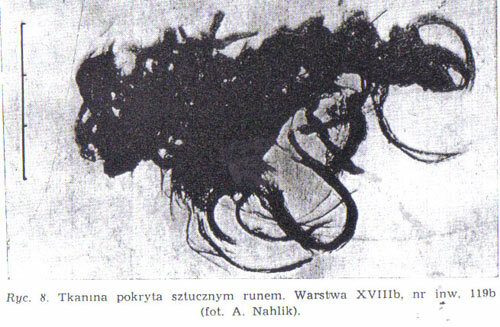 I am wondering if they were made like a hook rug, where yarn is drawn through the material and tied. I am also wondering if the shaggy area is over the entire garment or just at the lower hem and collar. If anyone has more knowledge of these mantles or has made one, I would love to hear your input. 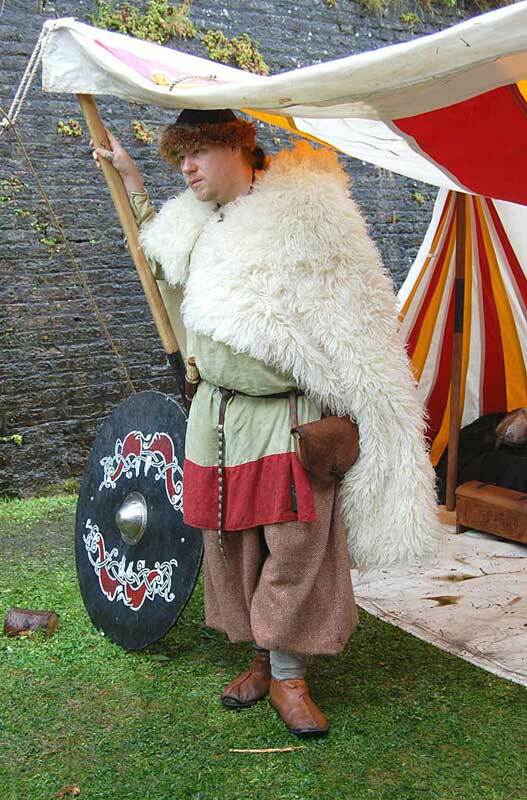 For early medieval period the woven cloth with 'fake fur' appearance was quite widely known. There are examples from: Swedish Birka and Lund, Polish Wolin, Leens and Dokkum in Netherlands, Isle of Man, Isle of Eigg, York, Dublin, Heynes Farm in Iceland - so all the areas where one would need protection from cold weather. 'Cloaks, capes and mantles of shaggy pile appear to have played an important part in Irish dress for considerable period of time. It is not clear when the first pile clothes were produced in Ireland. 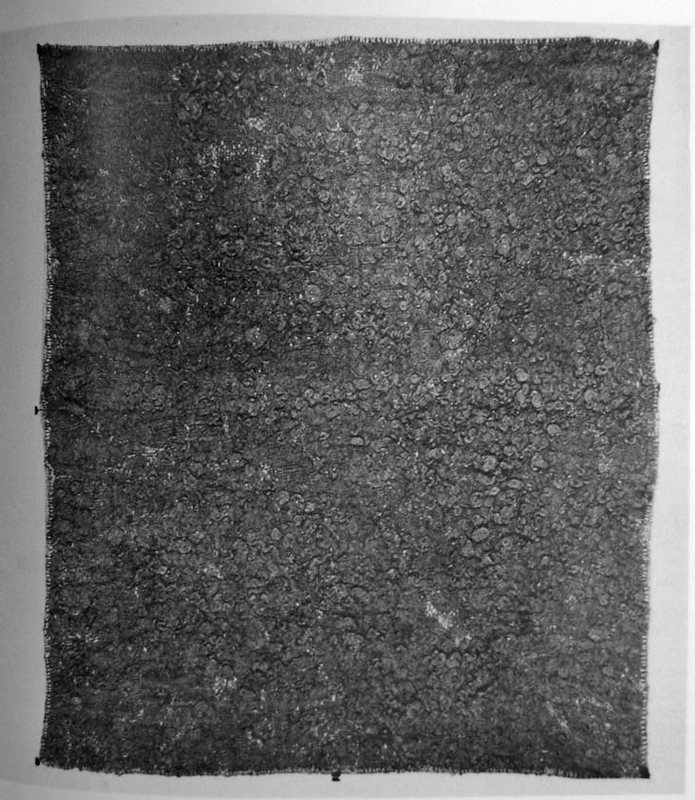 When information becomes available on export, there is, for example, from Cork, an item listed in 1284 for falinga, the Irish word for particular kind of cloak. This may as well describe a shaggy pile mantle. In 1354 in the Accounts of the Archbishop of Bordeaux the sum of 3 florins was spent on the purchase of ''a mantle of Ireland''. However, monkish chroniclers of the 11th 12th century settling down the oral traditions of an earlier Ireland give details of the clothes worn (presumably mirroring those of their own time). Curly fleece mantles are often described. In the story or “The Destruction of Da Derga's Hostel” the dress of Etain, the heroine is described in these terms ''There was a crimson cloak of beautiful, curly fleece around her, fastened with a silver broach coiled with lovely gold.” Later in the same story the woman called Cailb is said to be wearing “a very fleecy, striped mantle.” Again, a man seen in a vision in this tale who is a steward in a king's household wears “a very fleecy cloak”. Similarly three youths wear cloaks “as feecy as a ram” and another man “a fleecy crimson cloak”. The material for such cloaks might be similar to the remains found at Viking Age sites like Kildonan, Isle of Eigg, Birka, Sweden, Springhill, Rogart, Sutherland, Scotland and York, England. 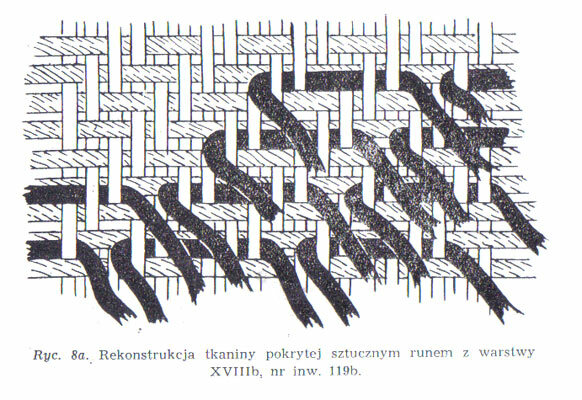 (This last reference is two pieces in which the pile has been inserted by hand afer weaving rather than being an integral part of manufacture.) A possible early Irish example isthe relic known as the mantle of St. Brigid. This piece is now in Belgium but is believed to be of Irish origin dating to the 11th century rather than the 6th, the presumed lifetime of the Saint. The textile is red in colour and is described as having a thick curly fleece woven in with either the warp (probably) or the weft. Dr A.T. Lucas, the distinguished Irish scholar has described ways of napping cloth used in Ireland to create a curled pile. These continued until recently and included the use of teaselsto brush up the nap. In pre-industrial days drops of honey were sprinkled on the cloth and then the surface was rubbed up with a bag of small stones so that the wool was twisted into curls. 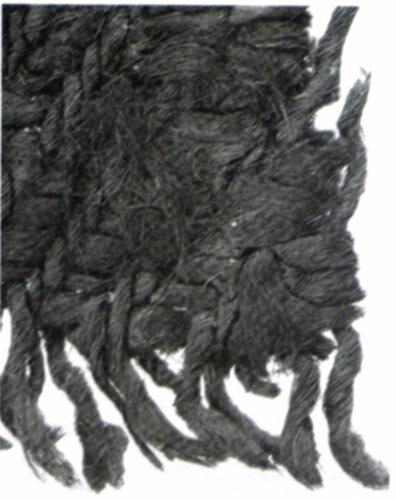 Lucas believes that the pile on the St. Brigid mantle was produced in this way and that other Irish shaggy cloths would also have been finished thus. There is also a whole chapter of Anglo-Saxon pile weave, both with inserted threads and raised nap in Cloth and Clothing in Early Anglo-Saxon England AD 450-700 by Penelope Walton Rogers. sewn to a man’s jacket garment—perhaps the only medieval instance of pink fake fur trim”. I made a shaggy cloak for Eryk of two modern flokati rugs, worked quite well . Apparently some people still make them in Iceland - http://www.thingborg.net/?page_id=540 , http://www.thingborg.net/?page_id=540 , I just used 2 sewn together 100% wool, white flokati rugs from Argos lol. The background weave was just a regular tabby weave, and the pile is proper locks of fleece, not too fluffy. I guess some Greek markets / shops may have something suitable. Some of the blankets are still hand made, like here: http://www.chulesblankets.com/history.html . I got mine HERE. It's an excellent replic of a Hedeby Viking find. Three weeks ago we lived one week in the rebuilt Houses on the Hedeby grounds, we had heavy snow, fu**ing easterly winds and temperatures went down to minus ten celsius. Those blankets saved our lifes!! Vlasta, several of us have been debating getting flokati rugs, but were not sure if they would be the same thing? Flokati rugs do look good when made into a cloak, but I wonder if one could make a good looking shaggy cloak by using woolen fleece or using faux fur stitched to a plaid fabric or something. finnobreanan wrote: Does anyone know of a source for reproductions? These people might be able to make one for you. I've been thinking of asking them about exactly the same thing. Manx Loughtan fleece with a striped border maybe? Whoo-HOO!! !Have asked for a price. Will pass it on when I know.